Chanukah! It’s all about the lights. Not just the physical lights affixed atop dazzling Menorahs of all sizes, shapes and designs, but more so, the spiritual lights of Jewish pride and solidarity they represent. As in past years, we have launched our "Let There Be Light!" project – featuring Menorah displays, kindling ceremonies and celebrations in public squares and at popular landmarks throughout the Putnam County. Over the course of the holiday, hundreds of men, women and children will look up and see lights that speak volumes about the ideals of human kindness, tolerance and peace; they will join in the joyous communal singing of Maoz Tzur, the tasting of sizzling latkes, the spinning of dreidels, the distribution of Chanukah gifts to the needy, and the delighting in centuries-old customs and traditions – all sponsored by Chabad of Putnam. Likewise, seniors in assisted living facilities and patients in hospitals throughout the region will enjoy the Chanukah spirit – courtesy of Chabad! Please visit www.PutnamChabad.org/Chanukah for a full listing of all of our local events. None of this can happen without the support of conscientious people like you. 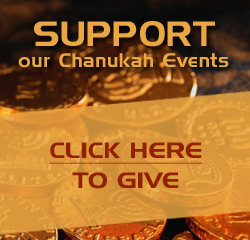 In this season of giving and sharing, I appeal to you to be a valued partner in "Let There Be Light," by extending timely Chanukah Gelt toward this very meaningful and impactful project. Any amount would be of great help! Click Here to make a secure on-line contribution. In merit of your concern for others and your commitment to Jewish pride and solidarity, may you be blessed with a very joyous and festive Chanukah, and may the spirit of peace and goodness light up the world!